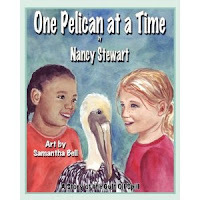 Nancy, just from the description of One Pelican at a Time, I can hear the seagulls calling. What inspired this particular story? Nancy: My husband and I bought a condo on the water in Clearwater Beach, Florida, three years ago. Although I didn’t know it would, that decision had a profound effect on me. I watched the marine life on our daily walks and quickly grew to love it all, particularly the brown pelicans. Who knew the spill would happen, and I would have the opportunity to help in a small way with their redemption? Don’t you live in the mid-west? Can you really know enough about saving pelicans just from a few trips south? Was there research involved? Field trips? Tell us a little about the personal growth of Bella and Britt during the story. Nancy: Because I was writing about the two girls, their character development needed to be different. They had to be seen as separate children reacting differently to the crisis. Bella is Type A all the way, a go-getter, wanting every answer now. Britt is more studied, quieter. She is a thoughtful and sensitive girl. I hope these differences come through in my writing. They certainly did in Samantha Bell’s beautiful illustrations. This is a series, correct? What is next for Bella and Britt? Nancy: Yes, it is. The first book written was Bella and Britt Save the Beach. It deals with trash along the beach—a big problem. It was to be the first one launched by Guardian Angel Publishing, but then the spill happened, and Pelican was written and went first in the series lineup. The second book is Sea Turtle Summer and features the girls’ struggle to save a sea turtle’s nest after they make sure the female turtle gets safely back into the water. I’ve had so many people ask for a Bella and Britt book dealing with dolphins and/or manatees. I’ve been giving it some thought, but no matter where my muse takes me, the girls and the old crooked beak pelican will be dear to my heart. Let’s learn a little about you! Can you share with us a favorite memory from when you were the target age of the book? Nancy: The target age is between seven and twelve. I do have a favorite memory from about the age of nine. It was right at the end of school, probably May, and our school was holding a flower show. There was a contest, and I picked flowers from my Mother’s garden that morning and arranged them. I remember there was a large pink peony right in the middle. I won the contest! I even remember what dress I was wearing. Why is this such a strong memory? Maybe it says something about my competitive nature, although I want it to be only that I love flowers and gardening so much! When visiting the beach, are you more likely to be found building a sand castle, playing in the waves or sunbathing? Nancy: None of those, actually. You’ll find me walking at water’s edge, my toes in the surf. It’s a great place for me to get ideas for books or, if I’m “written out,” just think of nothing at all! What did you want to do when you grew up that you ended up not doing, and why didn’t you do it? Nancy: Oh, that’s a tough one, because I always only wanted to be a teacher. Perhaps it was the time in which I grew up when girls’ options were a bit more limited, but I really don’t think so. I just always wanted to teach. It is strange, though, what happened with my teaching of young children. One day I went happily to school, as usual. The next day I had burned out. That quickly it happened. The very next year I began graduate school and became a university professor of education. Oh, how I love writing those books for young children, though! Where can our readers learn more about you and One Pelican at a Time? Thank you, Nancy, for stopping by today. I wish you and One Pelican all the best! Thank you for hosting me. I love your blog! Thanks, Nancy! Hope you have as much fun on the rest of your tour as I had hosting you and your great book.